I am absolutely loving all the woodland decorations this year! There are so many wonderful owls, birds, and woodland creatures that you can incorporate into your existing decor. 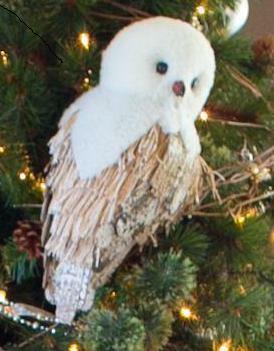 I decorated this tree using a mixture of three key elements: Silver, wintery whites and owls. A grapevine wreath was taken apart and used as a garland. Silver balls, sparkly jeweled snowflakes and assorted ornaments reflect the light and add a little glitz to the woodland theme and furry white over-sized ball ornaments. Glittered curly picks were added to the tree for bit more sparkle and texture. A vintage sled does double duty to hold presents and hid the artificial tree base. I placed the base in a large seagrass basket and covered the top with white burlap. Presents wrapped in fun papers – chevron and animal prints – add a little pop of color. Whatever your theme or decorating style, have fun with it. And most importantly, enjoy old traditions, making new memories and the time you spend with friends and family during this holiday season. Gallery | This entry was posted in Events and tagged silvler and white decorations, Vintage sled, winter woodland christmas, woodland Christmas, Woodland owl. Bookmark the permalink.